When Kelly and Jane Littlefield built their gallery in Winter Harbor ten years ago, they were choosing a lifestyle as well as a location: the Schoodic Peninsula section of Acadia National Park, one of the most beautiful places on the East Coast. While it may seem like "you can't get there from here," Littlefield Gallery has become a destination point for art lovers from all over the country. 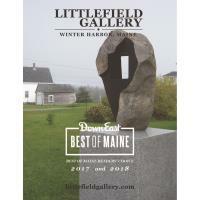 Representing several of Maine's most distinguished sculptors and painters including Joseph Haroutunian, Roy Germon,and Lori Tremblay, the work transcends all passions- from Daniel Anselmi's paper collage abstractions to James Linehan's stylized landscapes. Sculpture is an integral part of the gallery, surrounded outdoors and in by pieces created by sculptors including Mark Herrington and Hugh Lassen.